Open daily from 1 - 10 p.m. The Hill Tribe Restaurant was opened on October 10, 2008. Its owners - Khun San comes from the area of Chiang Rai in the north of Thailand. 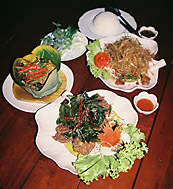 So far it has been the first restaurant in Khao Lak area to offer dishes from Northern Thailand. Khun San is an excellent and experienced cook. 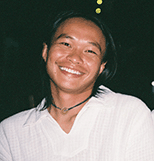 For many years he was the chef in restaurants in Phuket and at the Khao Lak well known restaurants Baan Suan (closed) and Takjang. With his famous creations like Seafood Hot Plate, Lemon Chicken, Spicy Banana Flower Salad, North Thai Sticky Rice with Mango he has won the most demanding palates of many customers. Khun San is looking forward to your visit at the Hill Tribe Restaurant.